The base-buillding strategy title sees players uniting the races of Shingård in a war against the evil Ice Queen. Stormfall: Rise of Balur developer Plarium has announced the release of its newest Facebook title, Nords: Heroes of the North. Loosely based on Norse mythology, the game takes players to the fantasy world of Shingård, where they’ll lead an army of elves, dragons, northmen and orcs against the evil Ice Queen, who plans to conquer the world. 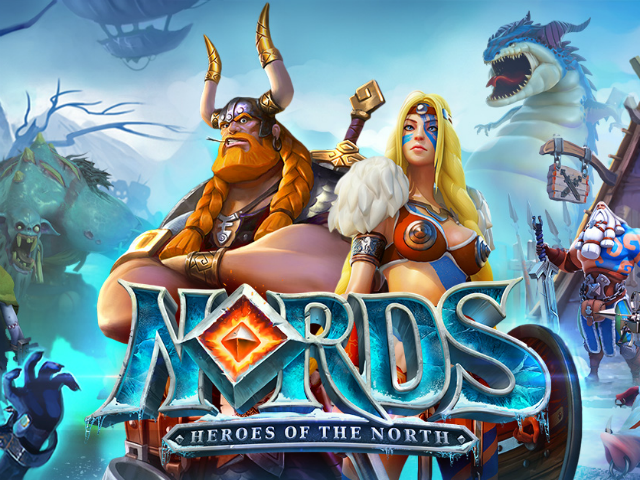 Nords: Heroes of the North is a base-building strategy title, which begins as players choose one of three Champion races to represent them in the game (northmen, elves or orcs). This decision determines the appearance of one’s keep and stronghold, and players build the rest of their kingdom by balancing the use of three major resources: mushrooms, fish and ale. Gamers are led through the game by quests, which provide them with plenty of free resources and other prizes. As players build an army to protect their kingdom, they’ll need to sign pacts with other regions to unlock new troops and buildings. Like the game’s construction and building upgrade timers, these pacts take time to sign, but any task under five minutes can be skipped for free, while longer timers can be decreased using premium currency or boosts. Once recruited, gamers take their soldiers to the world map, where they’ll find other players’ strongholds, as well as settlements and battlegrounds to conquer. Once players have assigned their army to a battle, soldiers travel and complete the interaction automatically, bringing back a battle report after the mission is complete. While this combat system is typical of Plarium’s strategy games, Nords: Heroes of the North does offer an additional 3-D battle view, allowing players to view their soldiers in action on the field. As players complete battles, they may receive new equipment for their Champions. Equipping these items offers stat boosts to any of the troops under their command. Finally, as a social title, players can chat with others in real time or join Clans with other gamers. Users can also track their stats on the game’s leaderboards. Nords is Plarium’s most innovative and ambitious project to date as we are offering more than just strategy and the type of gameplay our fans expect from us. In many ways, Nords is a new venture for us because we are taking ourselves less seriously and are releasing a game that is as funny as it is charming, with new features and added focus to our RPG systems. Part of this ambition comes from Plarium’s decision to hire 30 professional actors for the game’s voice work, including Patrick Warburton of Family Guy fame. Nords: Heroes of the North is available to play for free on Facebook.